Lonnie Wheatley, TULSA, Okla. (July 25, 2018) – The Lucas Oil POWRi West Midget League presented by Executive Concrete NWA is back in action this Saturday night atop the 1/5-mile I-44 Riverside Speedway in Oklahoma City, OK. The 16th round of competition on the 2018 for the POWRi West Midget League also marks the eighth round of Sooner Series action for the series. Saturday’s I-44 Riverside Speedway tilt will count toward POWRi West Sooner Series points as well as POWRi West overall points. In total, more than $12,000 in points fund money is up for grabs in the POWRi West Midget League and POWRi West Sooner Series action for 2018. Thus far, Springfield, Missouri’s Kory Schudy is leading the way in both categories. Schudy has racked up nine overall top-five finishes in POWRi West action including a May 12 win at Port City to build up a lead over 15-year-old Hank Davis of Sand Springs with Nixa, Missouri’s Wesley Smith, Broken Arrow’s Hannah Adair and Bixby’s Cannon McIntosh also among the top five. Schudy leads the way in Sooner Series points as well ahead of Adair and Newcastle’s Trey Marcham. Broken Arrow’s Jonathan Beason will be gunning for a third consecutive series win at I-44 Riverside Speedway after topping hotly contested events on April 28 and then June 16. With that pair of Oklahoma City triumphs, Beason ranks as just one of three drivers to post multiple POWRi West Midget wins so far this year with Christopher Bell and Wesley Smith also capturing two wins apiece. Single wins have been claimed by Schudy, Davis, Blake Edwards, Ace McCarthy, Tucker Klaasmeyer, Jake Neuman, Logan Seavey, Tanner Carrick and Kyle Jones. In addition to Lucas Oil and Executive Concrete NWA, additional POWRi West Midget League supporting sponsors include Two-Eight Drilling, American Discount Auto Care, R&M Race Trailer and A1 Machine. Contingency sponsors include Smith Ti (Heat One), Keizer Wheels (Heat Two), Saldana Products (Heat Three), Rod End Supply (Heat Four), Pyrotech (Heat Five), BOSS Performance (High Point Driver), MPI “Official Steering Wheel” of POWRi West, Esslinger Engineering Performance Award (top-finishing Esslinger entry), and the MyChron Tom/AIM bonus of $300 (1st), $150 (2nd) and $50. Saturday’s racing action at Oklahoma City’s I-44 Riverside Speedway fires off at 7:00 p.m.
I-44 Riverside Speedway is located in southwest Oklahoma City off I-44 Exit 109, then 0.1 miles east on 149th then south. For more information, contact the track at 405-633-1583 or check online at https://www.i44riversidespeedway.com/. Current Lucas Oil POWRi West Midget League presented by Executive Concrete NWA Top Ten in Points: 1. Kory Schudy (Springfield, MO) 3,520, 2. Hank Davis (Sand Springs, OK) 2,510, 3. Wesley Smith (Nixa, MO) 2,440, 4. Hannah Adair (Broken Arrow, OK) 2,360, 5. Cannon McIntosh (Bixby, OK) 2,080, 6. Hunter Fischer (Broken Arrow, OK) 1,820, 7. Blake Edwards (Claremore, OK) 1,700, 8. A.J. Burns (Norman, OK) 1,460, 9. Brendon Wiseley (Sand Springs, OK) 1,360, 10. Zach Daum (Pocahontas, IL) 1,330. Current POWRi West Midget League Sooner Series Top Ten in Points: 1. Kory Schudy (Springfield, MO) 1,770, 2. Hannah Adair (Broken Arrow, OK) 1,320, 3. Trey Marcham (Newcastle, OK) 1,220, 4. Blake Edwards (Claremore, OK) 1,210, 5. Kade Taylor (Kilgore, TX) 950, 6. Hunter Fischer (Broken Arrow, OK) 930, 7. A.J. Burns (Norman, OK) 910, 8. Cannon McIntosh (Bixby, OK) 900, 9. Doug McCune (Colleyville, TX) 890, 10. Brendon Wiseley (Sand Springs, OK) 880. The Lucas Oil POWRi West Midget League presented by Executive Concrete NWA is slated for 29 nights of competition at 13 different tracks throughout Oklahoma, Kansas, Missouri and Texas. 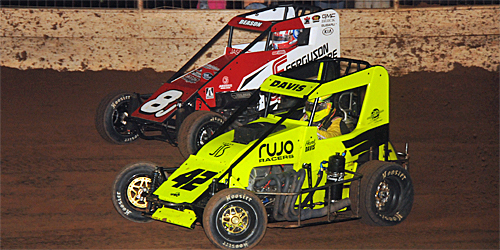 The POWRi West Sooner Series consists of the dozen events in the state of Oklahoma. More information regarding the POWRi West Midget League is available at http://www.powri.com/ and on Facebook at https://www.facebook.com/PowRiWest/.